Heres what I bought to have as a 'Summer' project. Nothing too drastic to be done, its already quite an individual kind of Elf in its own way. It has had an A+ Series 998cc engine put in at some point in the past which has around 40k on it. Plan is to make it as reliable as possible (if that is ever an option with a "Mini" !!!) and to run it alongside my "Sensible" car, a Mazda 3 Sport. Its currently on front brake drums which will be changed to disks but retain the 10" wheels. May also fit a servo at some point for some added stopping power. I've got my eye on a 1275cc engine that was burning oil when removed, so will need a 'rebuild' and if thats the case I might as well get it bored out to 1293cc while I'm at it. 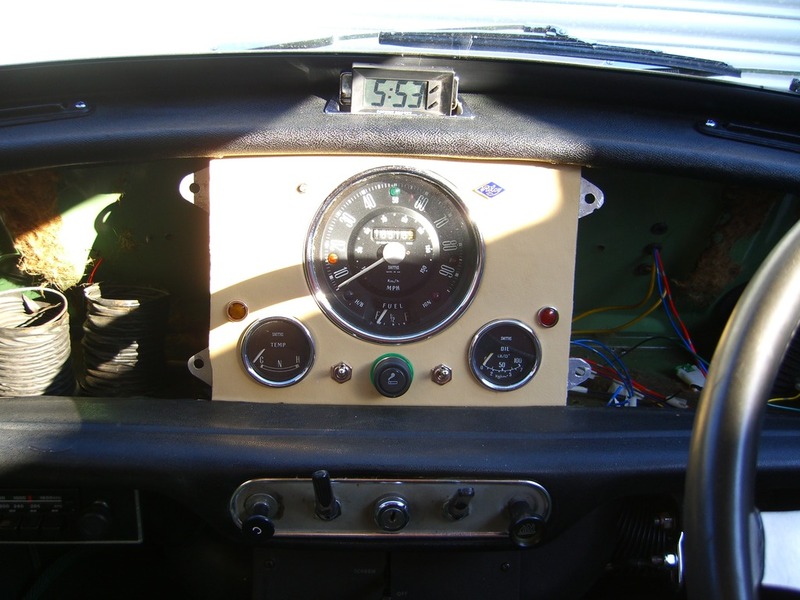 The original Elf Dash was showing bad signs of laquer crack-up which was spoiling the interior looks so I'm making a replacement copy Dash with the added advantage of some extra switches and an accessory socket, an alarm LED, and 3 x 52mm instruments mounted in the drivers side Glovebox lid. 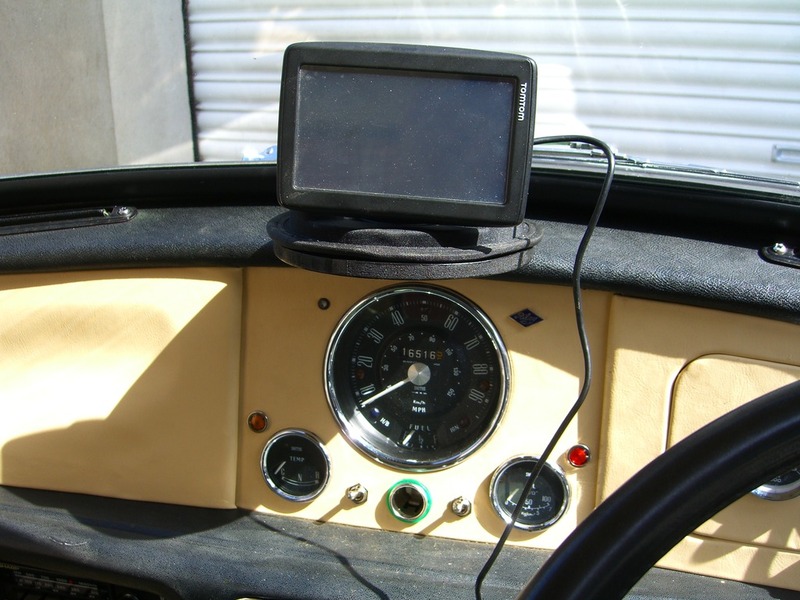 (a Rev counter, Battery condition gauge and a Vacuum gauge.) already fitted but mounted in a 'pod' under the heater ! 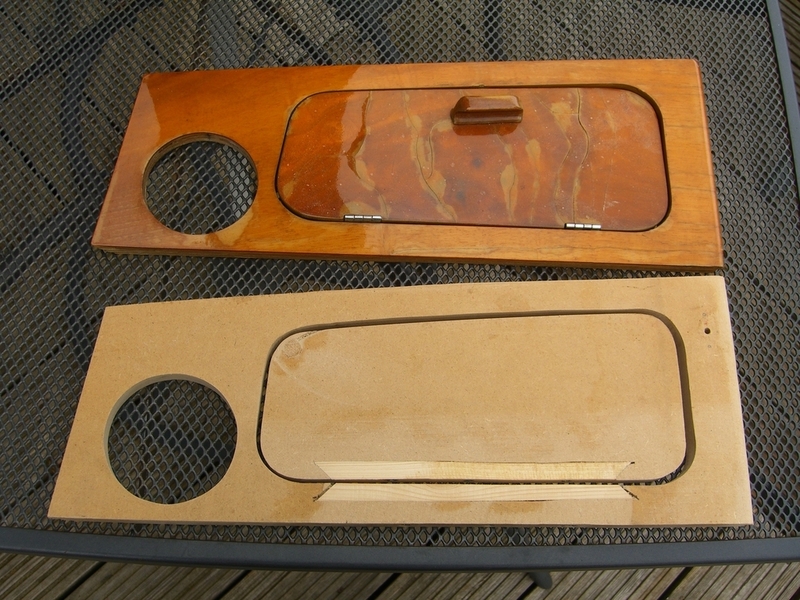 This dash will be made from MDF board and covered in a cream coloured vinyl - no more laquer to crack ! 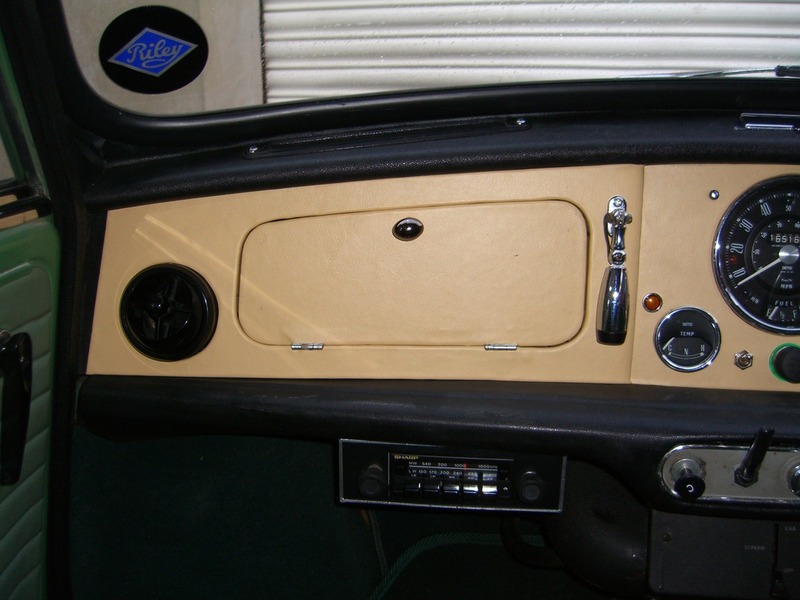 I also 'make' Under dash panels for Minis to house the radio, speakers, more switches, another accessory socket, and an additional 8 way spade type fuse box for better circuit fuse discrimination, so may well fit one of those to match the new dash. The rest of the interior will be kept pretty much 'standard' as I love that period look. 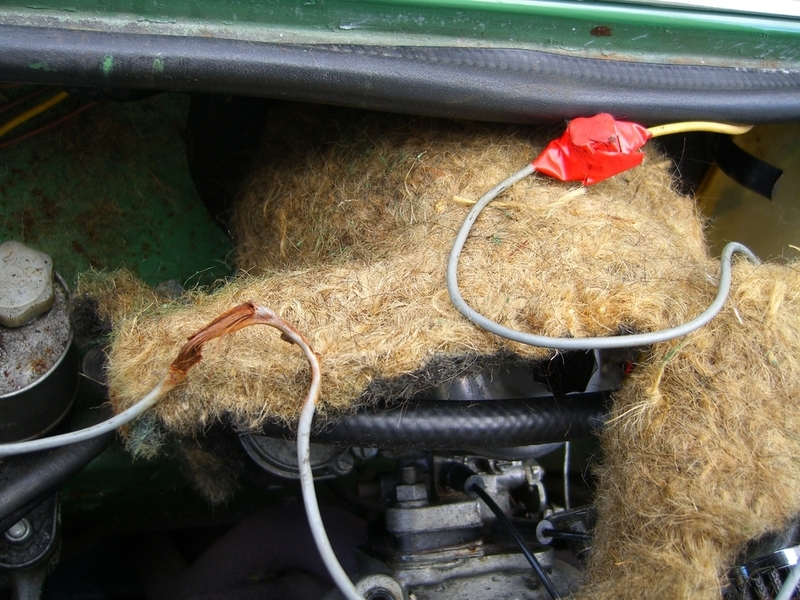 When I looked a bit more closely at the Elfs wiring around the engine bay I found some right 'horrors ' lurking there ! 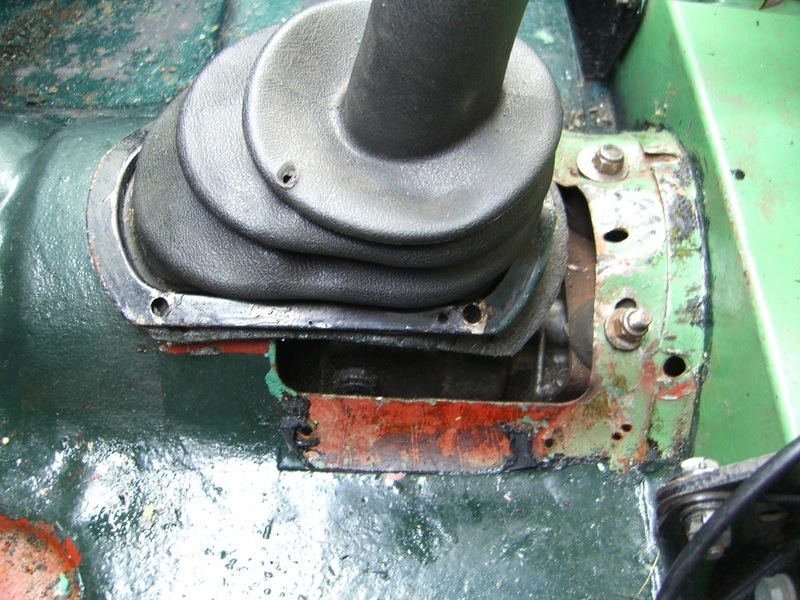 A cable had been routed underneath the bonnet hinge area of the bulkhead and this had happened ! and there was a "Chokky Block" under that red insulating tape ! Another No-no in engine bays ! 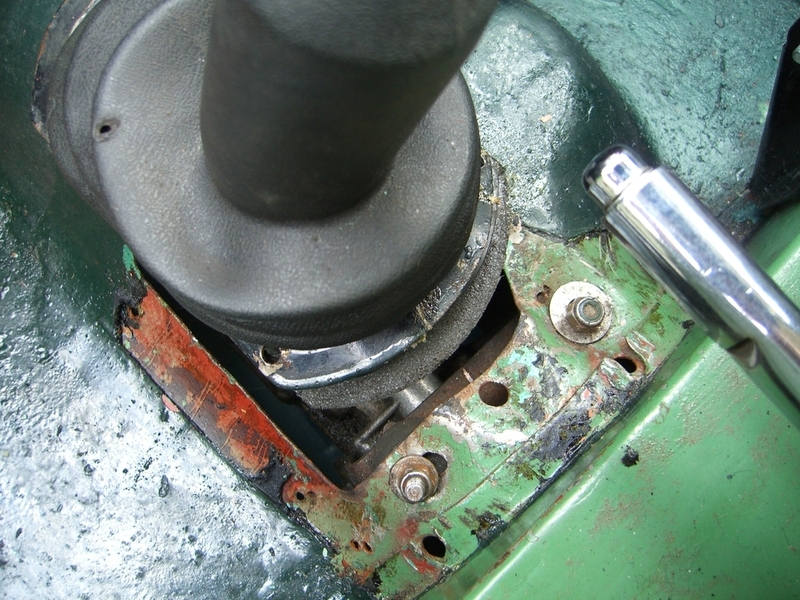 A 'pet hate' of mine is "Crimped" or "Squeezed" spade connectors, especially in the engine bay ! 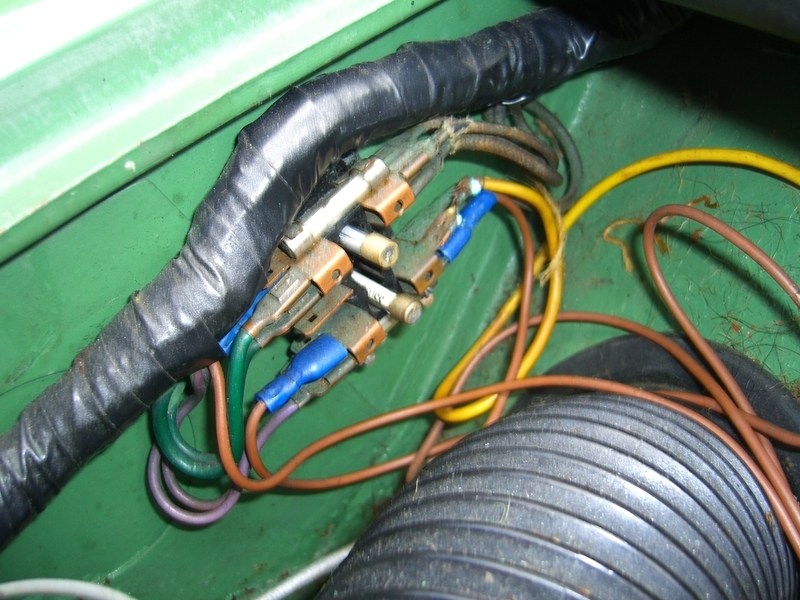 so all of those will be replaced by soldered and heat shrink insulated connections which should give far less trouble in the future. As far as 'Security' goes I'm fitting "Alarm Fitted" stickers on the reas side windows, a dummy flashing Alarm LED in the Dash and a cut out switch in the positive supply to the coil so from looking at the car from outside it will appear to have an alarm and even if it gets broken into the cut out in the coil circuit should prevent it from being started. There is already a Battery cut out switch fitted in the boot, under the boot board so thats an added bonus as well. 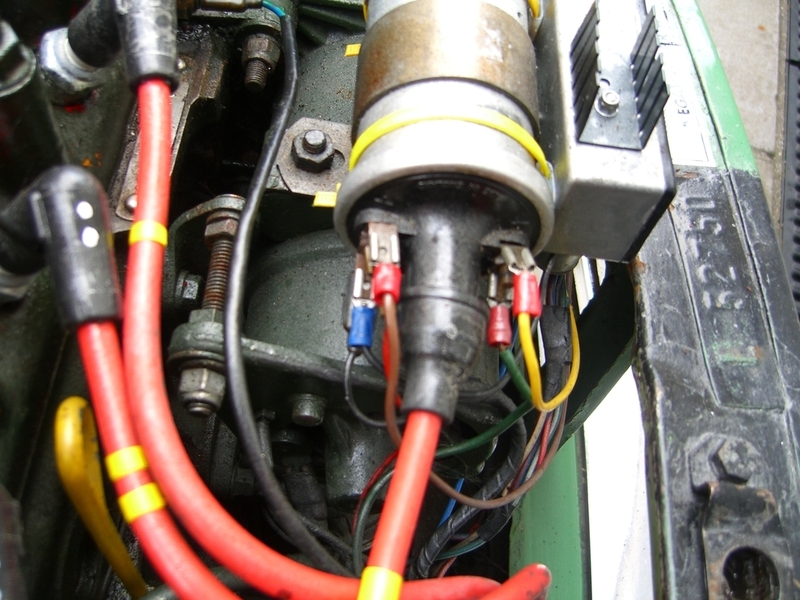 Its also an ideal way of dissconnecting the battery BEFORE playing with any permanently +ive wiring from the fuse box !!! The sealed beam headlamps are being replaced with Halogen P700 'tripod' units which should vastly improve the headlights ! I have also bought 2 x 100 Watt auxiliary Chromed Driving Lamps to be fitted on the front bumper which might help as well ! One "Modification" that I just had to do was to fit a switch in the passenger side door pillar which can isolate the interior light. 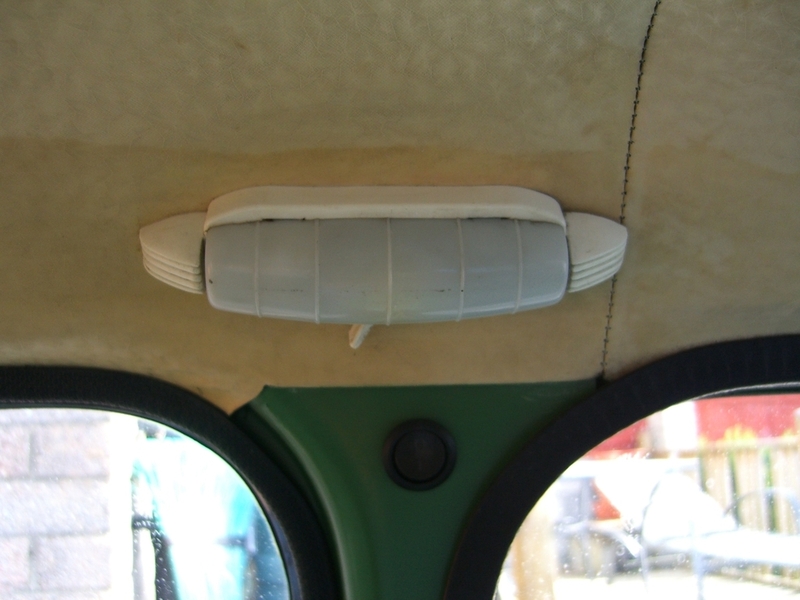 Early Mini interior lamps are always "On" if the doors are open and can only be switched permanently "On" by their fitted switch, no way of switching them "Off" - not the best design feature and can be a drain on the battery if you are working on the car with the doors open all day long. Looks to be a great little car you have there. 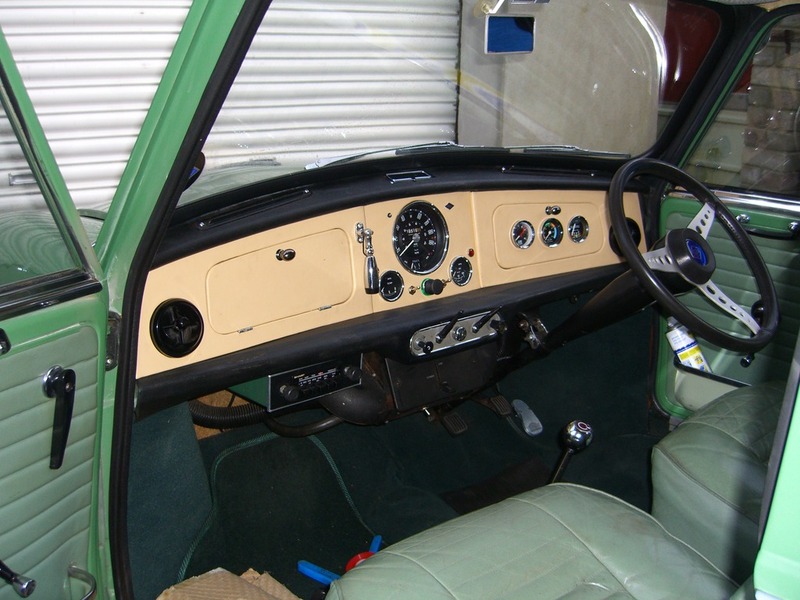 Good on you for doing the dash up, especially in cream, it'll go nicely with the green of the car I also quite like your idea of isolating the interior light. Any rust or bodywork to sort out? 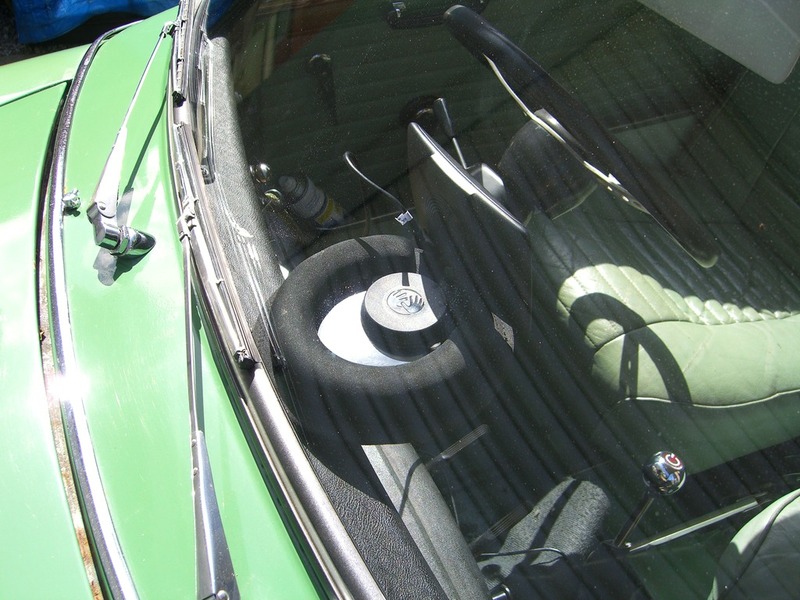 Are you going to be fitting the standard rims and wheel trim back on over the discs? Yes Jared, I'm keeping the 10" steels and trims for now unless I come across a 'nice' set of Minilites at one of the shows but I like the period 'standard' look as well. There is a small amount of rust ;bubbles at the bottom of both doors, not too bad at the moment but will need re-skinning eventually. Drivers sill step is showing small signs of rust as well so that'll probably be the next area to get the "cut it out and let some new metal in" treatment. The rest of the car is very solid as far as I can see. A restoration was done about 10 years ago apparently and its lasted pretty well in general. The paintwork is not perfect, theres some "orange peel" in the roof paint and some small scuffs and scratches here and there, but good enough for now at any rate. I've been covering and modifying the drivers side glovebox lid today. I'll put some pics up once its done. Still got to connect them up and fit a Glovebox lid knob for effect but for now I'll let the glue dry ! Just the passenger side left to do now, but thats just a conventional glovebox as the orioginal dash with the addition of a chrome maplight. Sounds like a solid car you've got there I'm jealous of the steering wheel! Dash is looking good too. I like the lower piece you're able to make too. 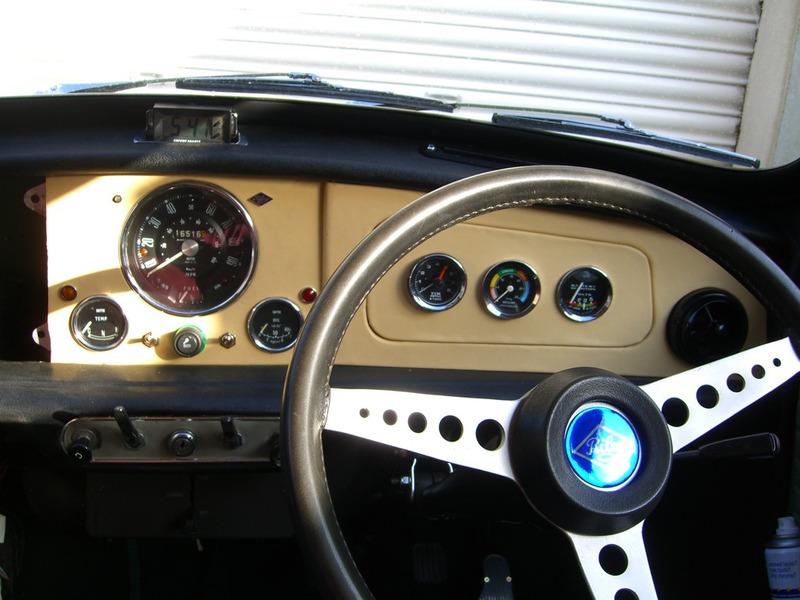 The steering wheel is off the old Austin/Morris1300 GT and I also have the original Elf steering wheel complete with its Riley center badge. Not sure which way the lower Dash is going to go yet but it'll be covered in the same cream coloured vinyl to match the main dash. It looks quite similar to the GTS steering wheel we had here in the Clubbies. I do like it I wouldn't mind a sporty wheel for mine, but I like the charm of the standard white wheel, so I'm undecided as yet. As with all things 'Mini', there is no right or wrong, its down to individuality and whatever you choose thats right for you. I think thats why Mini's, in general, have been so popular over such a long time. Through all the different models every one is 'different' and the personal choices of their owners make them so interesting and special. 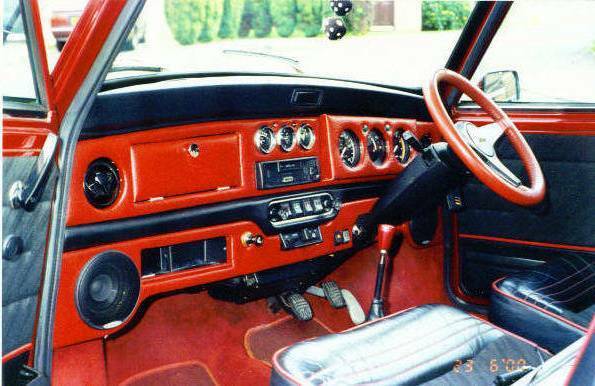 My 1st car, a very very long time ago was a Mk1 Mini 850 - 2 tone - Fibreglass & rust ! 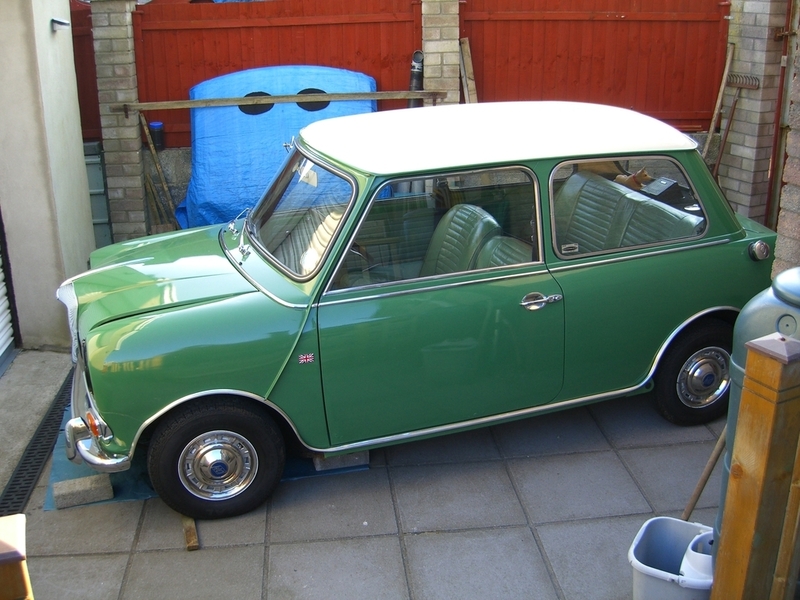 I spent more time underneath it than I ever spent driving it and it was constantly breaking down - but I loved it and have had "Mini's" in one form or another off & on ever since, and now I've got my first "Mutant" Elf ! 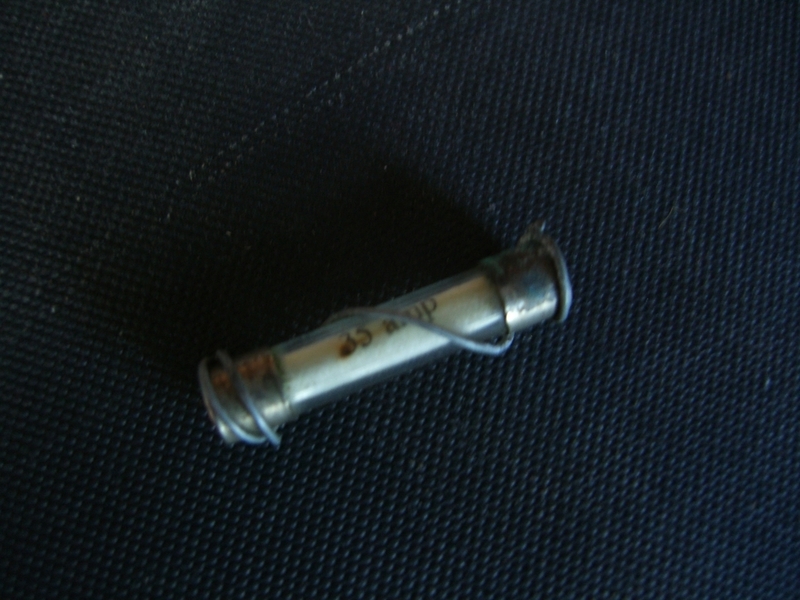 The fuse had blown and it looks like some 30 Amp fuse wire had been wrapped around it to make it work again ! The fusebox 'spring' terminal was also playing up as it wasnt making a constant contact with the end of the fuse so I replaced the existing fusebox with a new item (good old Ebay !) so hopefully thats another weakspot in the electrical system sorted ! I fitted an "Electronic" Flasher Relay to replace/upgrade from the original equipment item which tends to slow down or speed up depending on engine revs ! I hope thats mostly it now for the Elfs "Lectrickery" - but theres bound to be more to come I'm sure ! Tomorrow should see the drivers side of the Dash getting fitted properly and then its on to moking the passengers side of the dash. 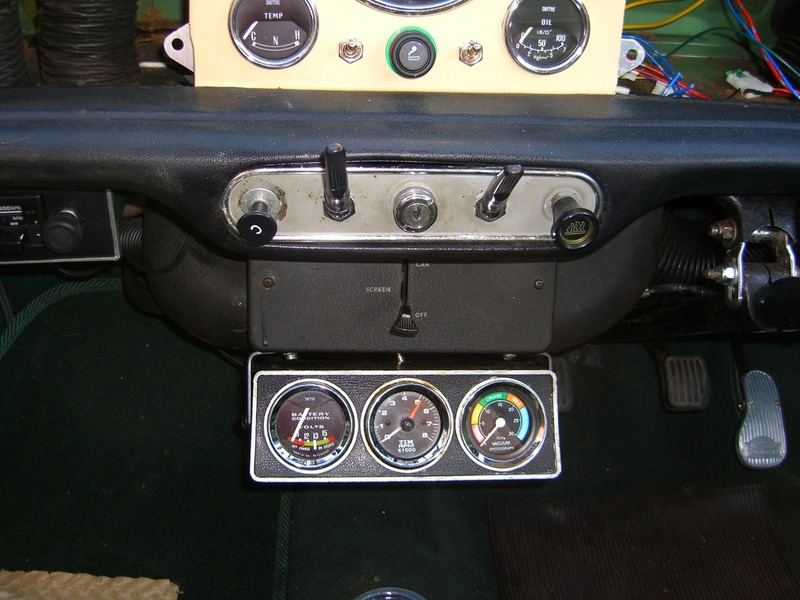 I took a similar approach with my dash. I liked the look of the Elf dash and wanted to keep it "original" looking, so I made a new dash on the Elf pattern, but with updated gauges. By the way, it looks like you're posting the thumbnails of your pictures from Photobucket rather than linking to them. It would be nice to be able to see them full size. Thanks RR. I was wondering if I should change them to full size or not but didnt want to take up too much space on the forum ? I will go back and change them all to full size if its not going to be a problem. I assumed that clicking on the thumbnails would open them up 'full size' as happens on our local Mini Forum, but no ! Bigger is better as they say !!! 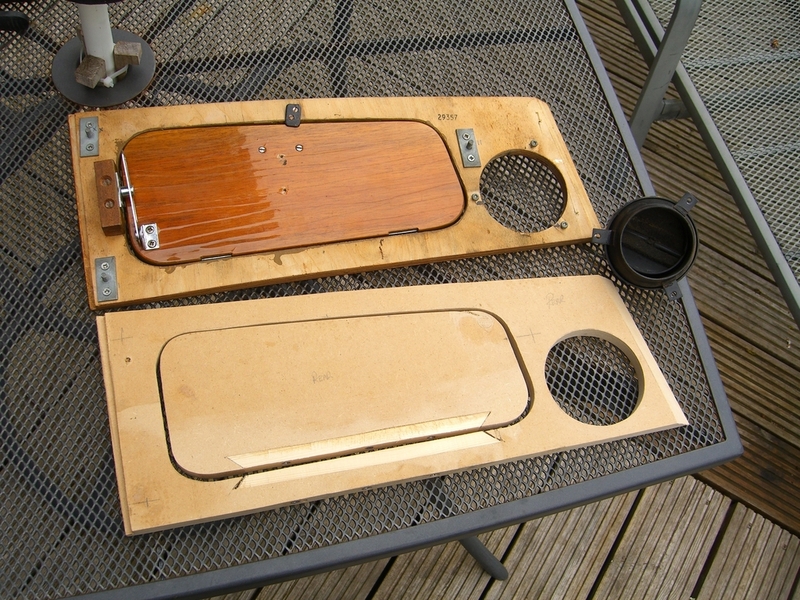 Got round to finishing the MDF cutting and sanding of the 3rd part of the Elf Dash - the passenger side. Inset some timber where the hinges are screwed in cos screws into the edge of MDF dont last very long ! 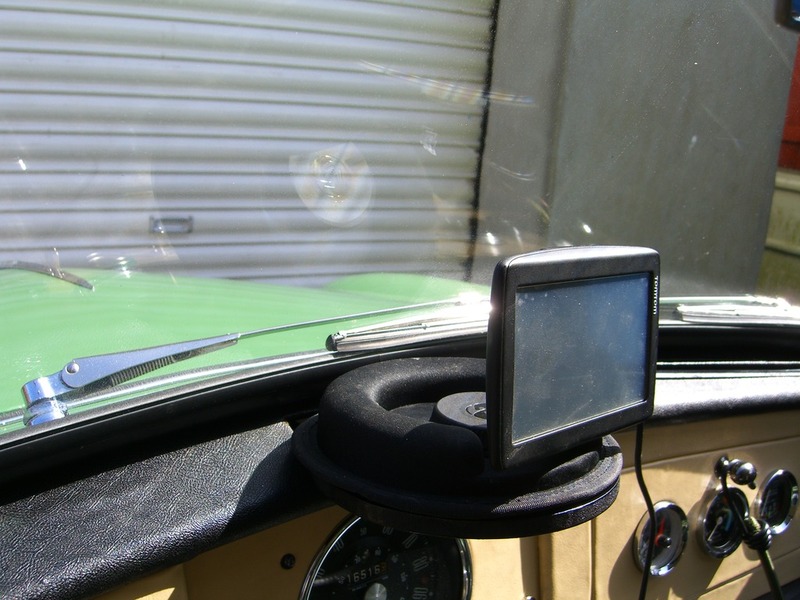 Also drilled a hole for the wire feed to the dash Maplight that will be fitted after the vinyl covering is applied. 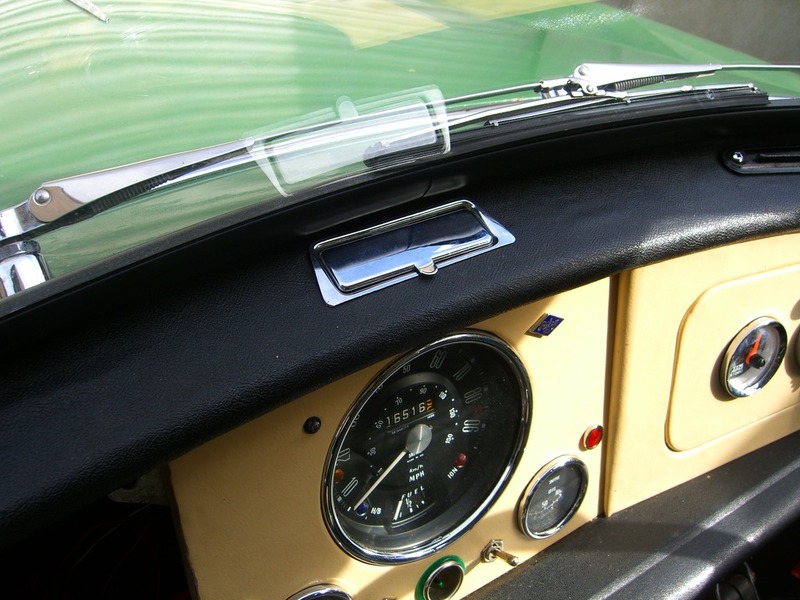 Only 'hardware' to be used from the original Elf Dash is going to be the 2 air vents as they are slightly smaller that later mainstream Mini air vents and have got rear fixing lugs. 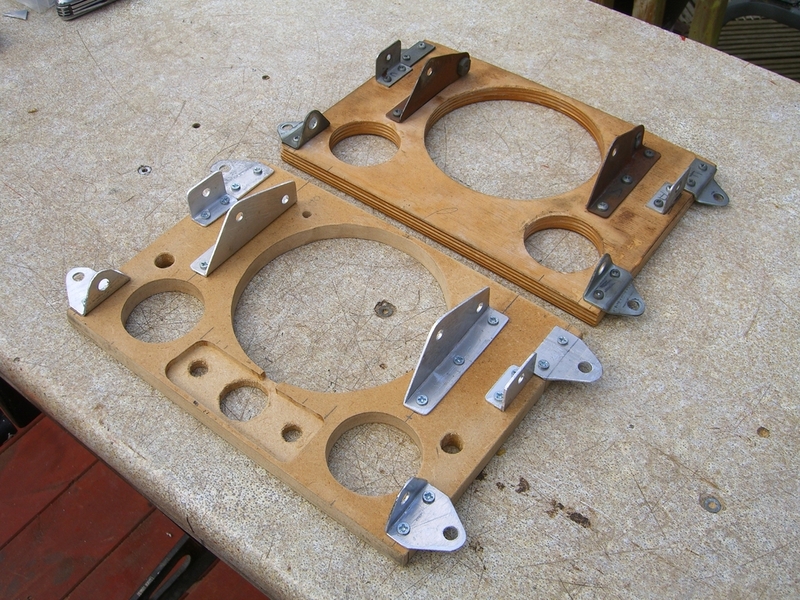 Will be covering with vinyl tomorrow and making and ataching the glovebox door fittings. 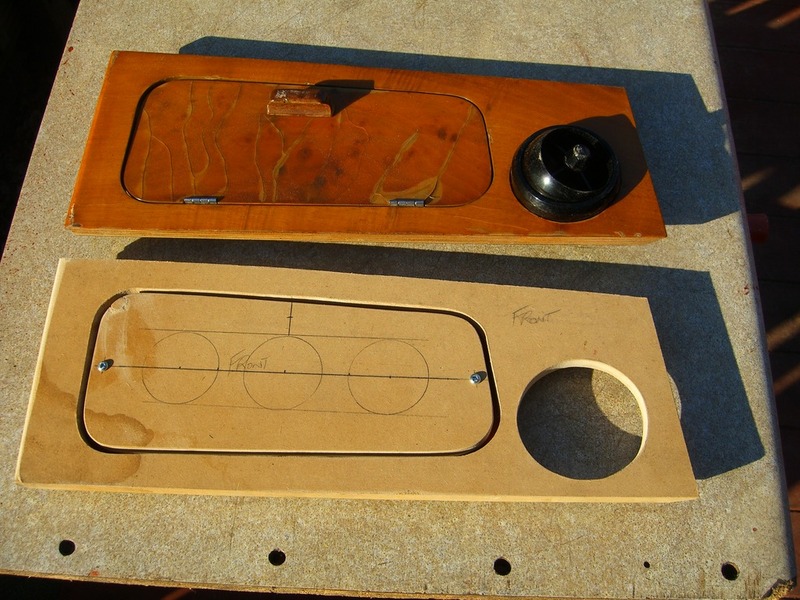 More pics to follow of the completed dash when its fitted into the car. 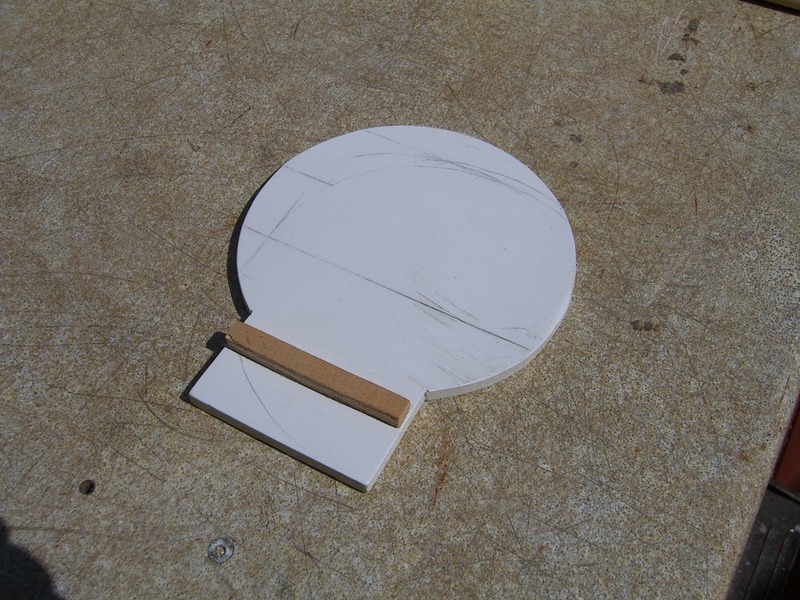 Had a scrap piece of UPVC lurking in the depths of the garage so took some measurements and cut out this shape. Fixed a small piece of plywood underneath. White not really the 'look' I was after so sprayed it Black. 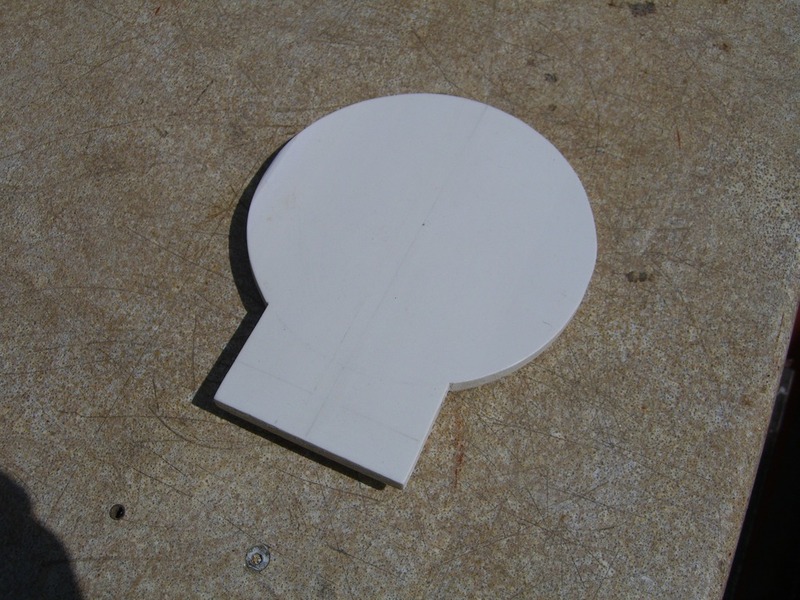 Can you guess what it is yet ??? 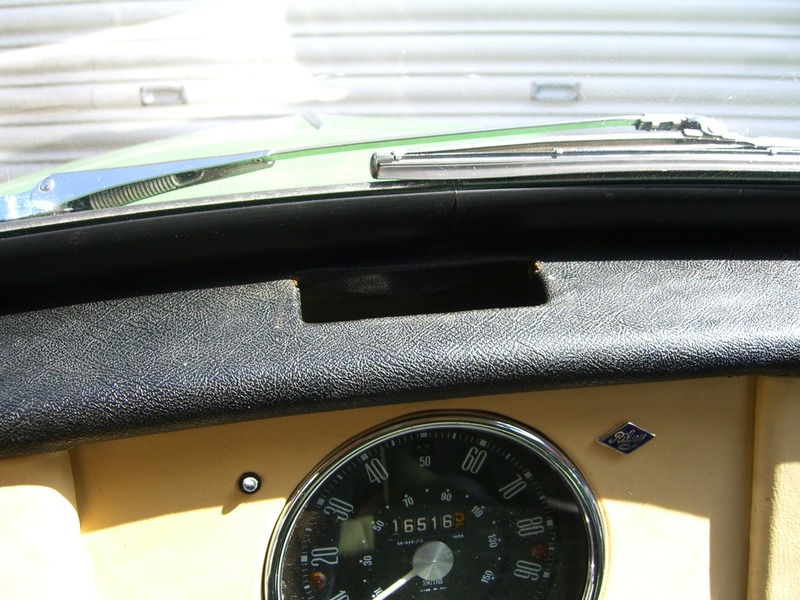 My top rail inside the Elf with chrome Ash Tray, all the rage in 1969 I guess ? 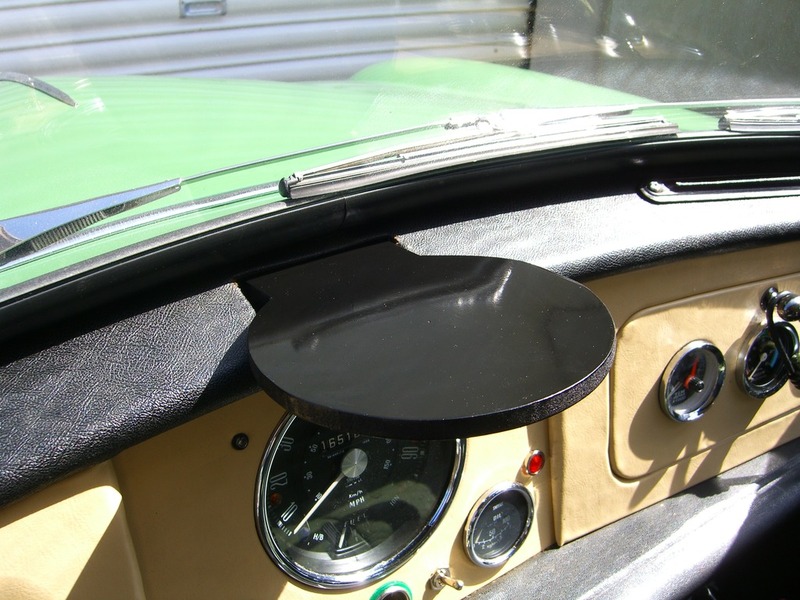 Now I really hate 'sticking' twatnavs on any cars windscreen so I got a weighted circular non-slip base that sits easily on any modern day cars vast space of dash top. This cannot be done in an Elf ......... untill now !!! This is how it looks from outside the car - not too ugly I think ! 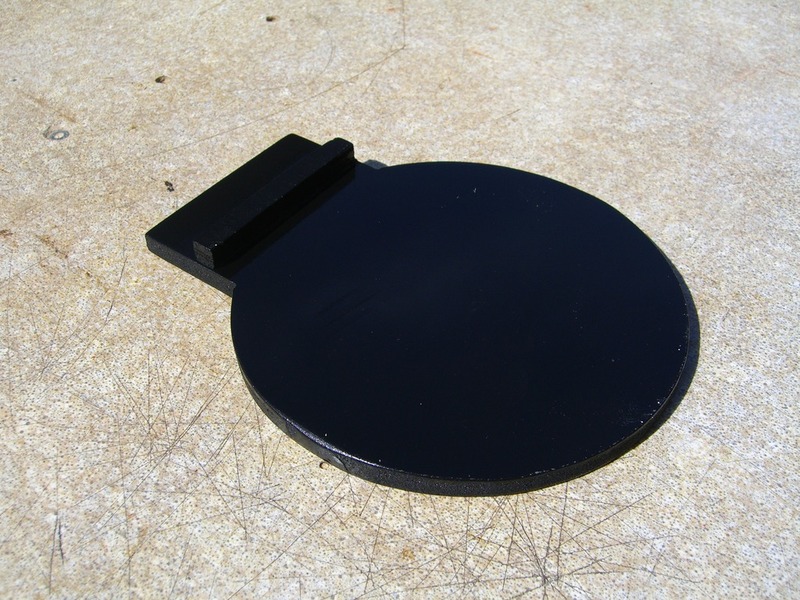 An added use is that with a small circular piece of non-slip matting it can also be used to hold coins or DAB Radio or MP3 Player or whatever else and it is very quickly and easily reverted back to the Ash Tray for the 'standard' look when required. 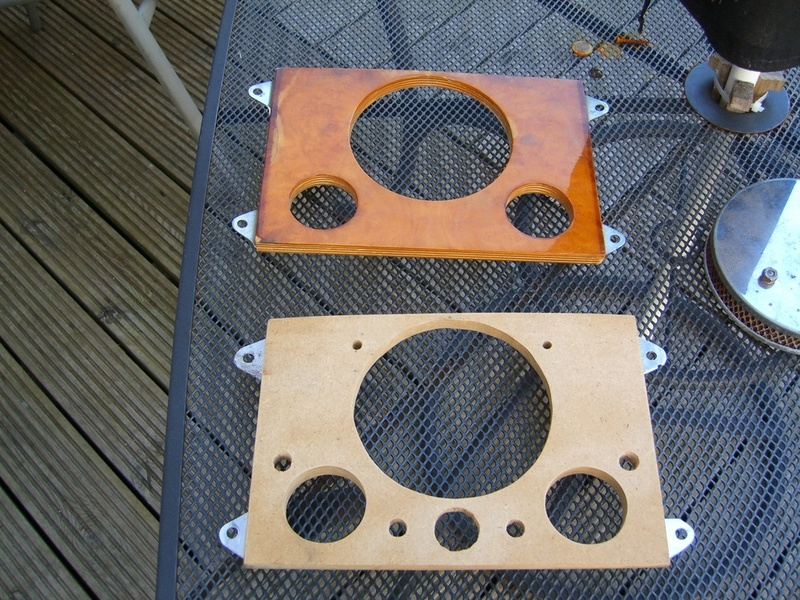 No holes drilled or permanent alteration done either. All in all not a bad day !!! Not too bad! 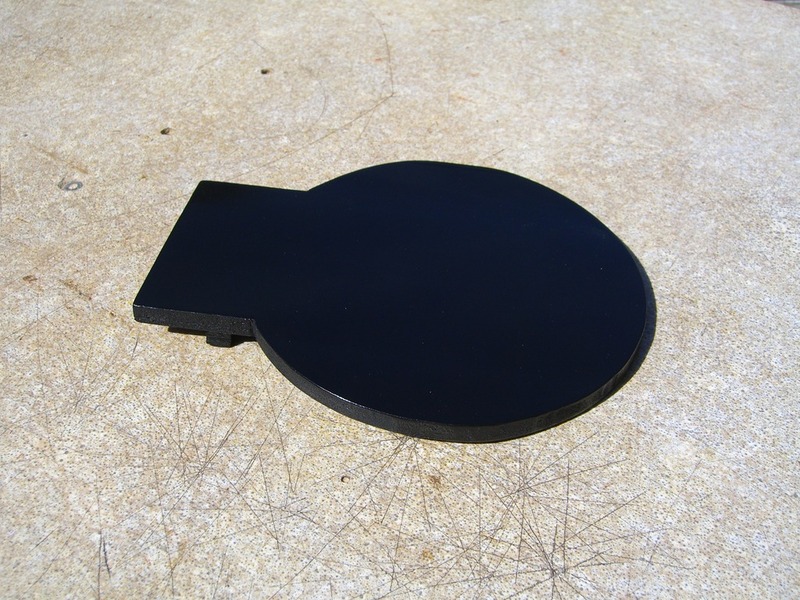 I would like to figure out a way to mount a small digital clock/thermometer/compass in the ashtray hole. Covered the Passengers side of the dash now and this is how the "finished" new dash looks. Still got to secure it in properly and 'tweek' the fit a little but its just about 'there'. 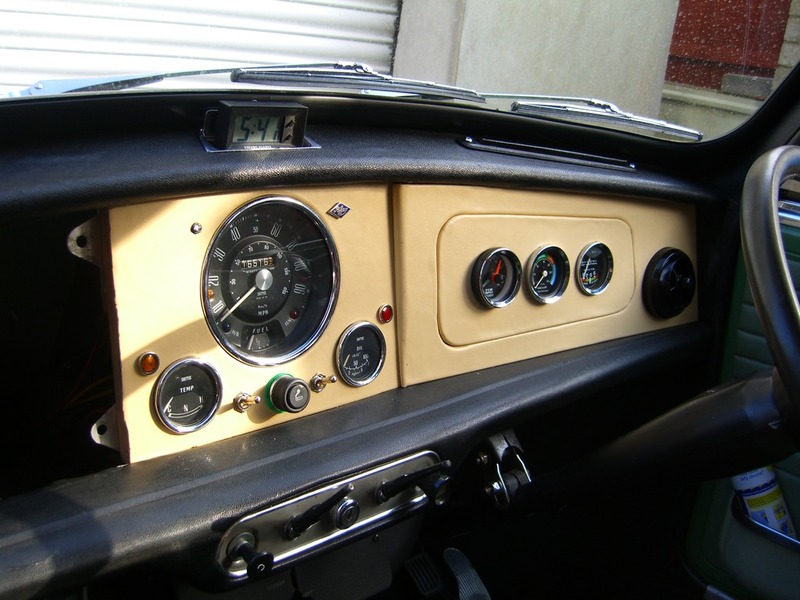 Think I'll have to cover the lower dash rail switch panel in the same colour vinyl to complete the 'look'. The final Passengers side section done today. 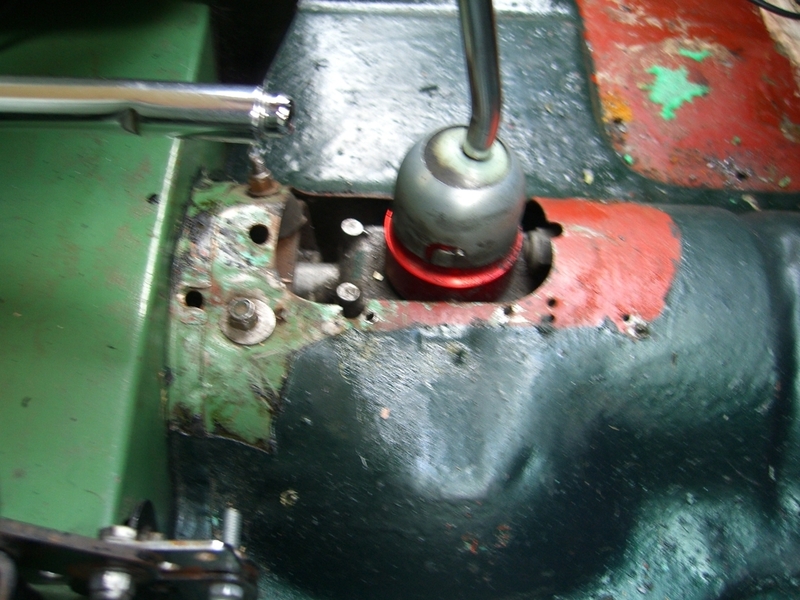 I've modified the two Glovebox lid knobs as well so that they can be turned through 90 degrees which unclips them and allows them to be opened rather than the original push fit type lids. That should stop them bouncing open when driving over any rough ground. I had the Map Light in a draw in the garage for ages so didnt have to buy that. 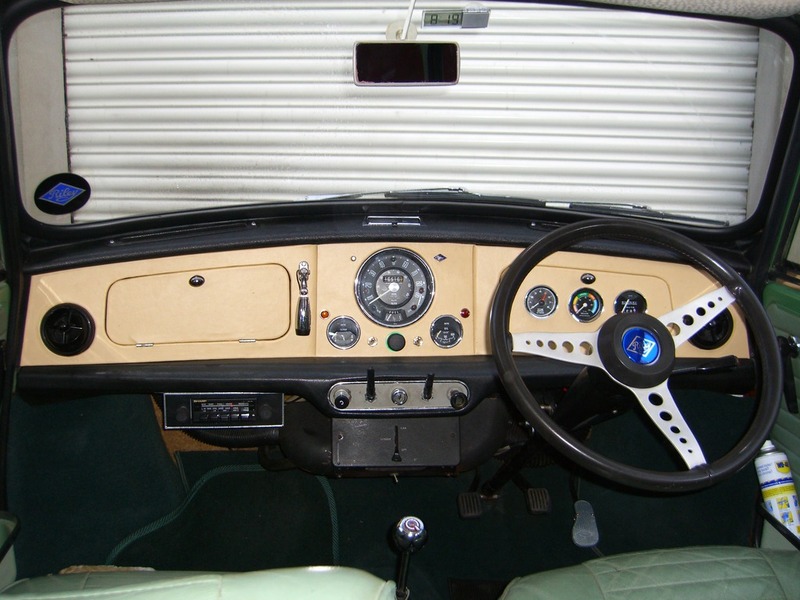 The Steering Wheel, like the Austin 1300GT itself, is a very 'rare' beast these days. I have been looking to buy one for quite a few years now but you just dont see any good, unmolested examples of them anymore. The map light seems to be a must have accessory at the moment, so prices are climbing . . . I know how you feel about the 1300GT. Cars like our Clubman GTS are few and far between, especially for original ones. 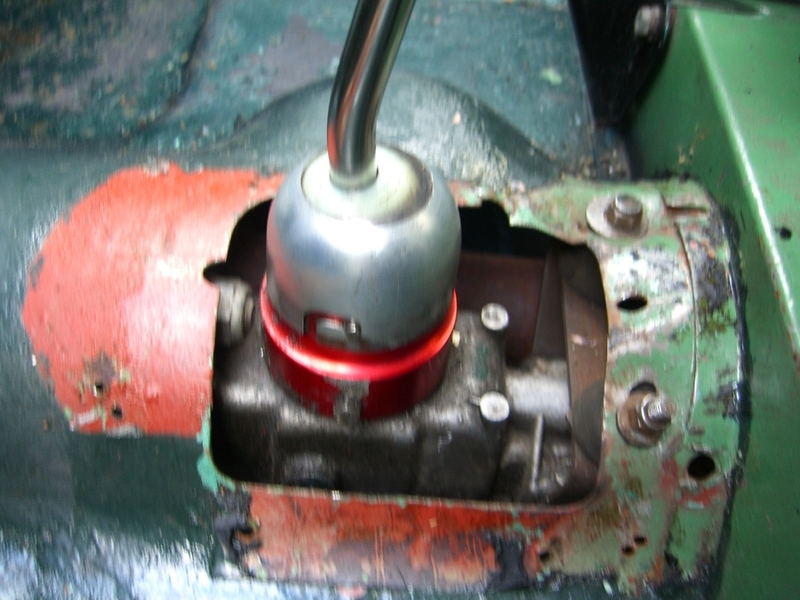 The "Quick shift" is a modification that I knew was there due to the very short movement of the gear lever - not sure if I like it or not but easily converted back to standard in the future if needs be. 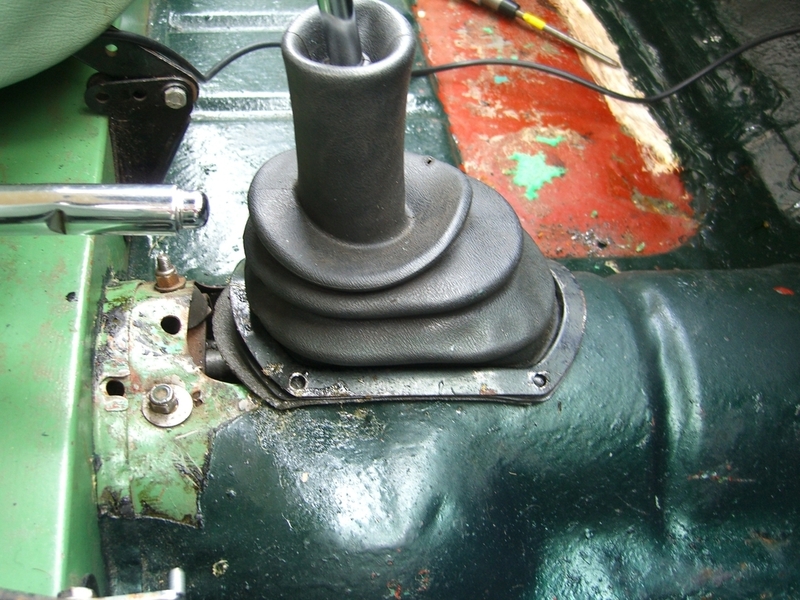 My Elf has been fitted with a later 998cc A+ Series Engine with only 40k miles on it along with the different rod change mechanism - hence the "holy floor" section. Can't understand why it was left that way but maybe whoever had changed the engine just had'nt got around to filling in the gap ! Needless to say its gonna get 'filled in' properly very soon !!!!! Maybe they were hoping to refit a remote shifter at some point and didn't want to fill the gap. Nah, that's probably not it.